Teachers would love to give each student individual attention whenever they need it, but packed classrooms often make that a difficult task. As a result, it's not uncommon for teachers to move on to new concepts even when some are still struggling to implement the skills that have already been covered. Educators are working to solve this problem in diverse ways, some moving to competency based learning systems that let kids move through curriculum at their own pace, and others doing the best to get students working independently part of the time while giving focused attention to others. 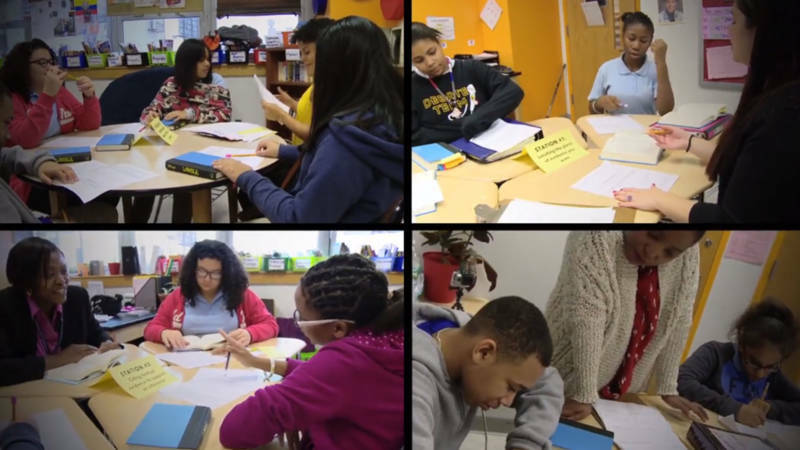 A Teaching Channel video spotlights Geneviève DeBose's efforts to do a better job supporting diverse learning needs in one large public school classroom. DeBose teaches seventh grade English Language Arts at Bronx Studio School for Writers and Artists in New York City. Over a third of her students either don't speak English as their first language or are struggling in school. She noticed that many of her students were having difficulty citing textual evidence to support their analysis. In an experiment, DeBose broke the class into four stations and used her student teacher and the two paraprofessionals in the room to help lead the lesson. DeBose focused on helping students identify key events in the text by giving them a bookmark with questions they can ask themselves as they try to figure out which events are core to understanding the text and which are merely detail. DeBose also leveraged peer tutors whose writing showed they understood the learning goal to help support the groups. Meeting the Needs of Diverse Learners from Teaching Channel on Vimeo.